This lesson was great! I’ve played for many years, I picked up this course for some ideas and address some wholes in my playing. Just when you think you know something inside out, Tom comes and turns your perspective upside down. Lots of great exercises and filled with information. Plus Tom is an amazing teacher who explains everything clearly. A solid class that builds on from the shell voicings lesson and explores the intricacies of jazz fundamentals. From rhythmic exercises and explanations, to colour tones and a deeper topic in "inner 9th’s, the knowledge is conveyed in a clear and concise manner, which, for me personally, is the most important part. very thorough lesson. Tom explains everything in detail, leaves nothing out. Super well organized. Thanks for sharing your knowledge. As usual with Tom the material is extremely well organized and very clearly delivered. 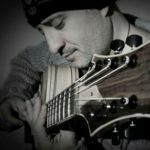 As a mostly self-taught guitarist I am very concerned about the holes in my instruction and with this series I feel everything is covered with a systematic approach. There are also brilliant tips like the ear training and the self-comping parts. Excellent tuition. It is very obvious to anyone who has purchased and went through Tom’s lessons that he has spent a great deal of time formulating the lesson plans and creating the material. In the Jazz Guitar Harmony series he takes you in a very systematic way through the fundamentals of Jazz guitar, providing written and audio examples along the way. I think the best teachers are the ones who have struggled through and really wrestled with the concepts they teach and after mastering them, share it with others. This appears to be where Tom is coming from and this is also why his teaching is so widely recommended in the jazz community. It’s often said that those who can’t do, teach – this is certainly not the case with Tom, his musical applications keep you inspired and motivated. I can’t recommend the entire series enough. molto buoni gli appunti in 11 pagine di esempi ed esercitazioni scritte. very good notes in 11 pages of examples and written exercises.